Offshore Wind: Which comes first – The developer or the supply chain? 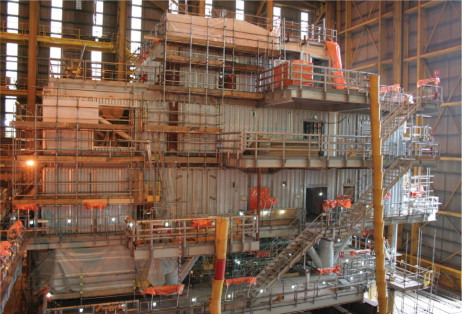 One of the platforms for Sheringham Shoal offshore wind farm as of May 2010 at Heerema's facilities in Hartlepool. (Image © Kari Williamson). Clipper Windpower's blade factory under construction at Shepherd Offshore in May 2010. (Image © Kari Williamson). JDR Cable's Hartlepool facilities. (Image courtesy of JDR Cable). JDR Cable is producing the array cables for the London Array offshore wind farm. The supply chain does not only consist of the ‘nuts and bolts’ of wind turbines and their foundations. There is also a question of workforce, not to mention the equipment and manpower needed for operation and maintenance (O&M). Charles Reynard at legal firm Eversheds' Energy Team says several clients in the North East England are already recruiting based on announced offshore wind developments in the UK. David Levin, also at Eversheds, has been involved with the Forewind consortium which will develop the circa-9 GW Dogger Bank zone off the east coast of England (though Levin is keen to emphasise he is not a spokesperson for the consortium). “Forewind, as far as the North East is concerned, is now where we're beginning to look for our resource,” Levin says. He does not believe Forewind in particular will have many problems organising its supply chain. “The wonderful thing about Forewind is that the consortium – incorporating the members and the owners – has a complete bible of how to build and deliver projects. Some are used to being at the utility end like SSE; and Statoil does oil and gas platforms around the world and in difficult conditions. What they do have in common is they do know how to source labour, skills and experience. “History shows that in all of these projects, local supply is important,” Levin adds. One example of being proactive is Shepherd Offshore Renewable Energy Park in North East England. 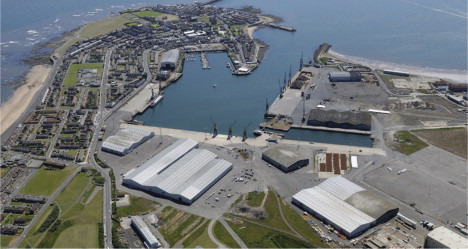 The family run company is in the process of converting a former shipyard into a potential manufacturing and service hub for offshore wind, wave and tidal. So far, Shepherd has invested £10 million. Bruce Shepherd, Managing Director, says the park could accommodate cable manufacturers, wind blade manufacturers, turbines, nacelles, towers, subsea structures, as well as foundations etc. Clipper Windpower has already signed a lease, and its blade factory for the 10 MW Britannia turbine is already under construction. Clipper is due to move in at the end of the summer and start production this autumn, Shepherd says. Shepherd Offshore has also started building supply chain units – smaller units for companies servicing the industry. “There will be about 20 units [available by the] middle of next year,” Shepherd says. The build-out is not just for the UK Round 3, but also for what comes after. “We are trying to make sure that what we put in now will last the life of Round 3 and [beyond]. Shepherd Offshore has not signed anyone up for the sites yet other than Clipper Windpower, although he adds “we're having one or two non-disclosures. We're talking to the supply chain and the manufacturing industry, but nobody is signed up apart from Clipper at the moment.” Nonetheless, Shepherd is optimistic: “We hope to have the major infrastructure in by Christmas.” The site is expected to be fully developed by the end of 2012. Just like Shepherd, port operator PD Ports aims to be ready for the expected influx of offshore wind manufacturing capacity, and the associated supply chain, and has been in discussions with “people in the industry”. However, it is not all that easy to plan ahead. “It's difficult, because where do we start? Do you talk to Forewind? Because you speak to Forewind and you say: ‘right, who are you going to buy your turbines from?’ – ‘I don't know.’ ‘When are you going to decide?’ – ‘I don't know.’ So you then get the manufacturers, and the manufacturers say: ‘We hope to sell some to Forewind, but we don't know yet.’ This is the kind of debate we had with Forewind,” says Paul Barker, Development Director at PD Ports Hartlepool. Barker says that if someone comes and says: ‘We want you to strengthen the quay’, that could easily cost PD Ports over £10m, and it could take 46 weeks to have it complete. And PD Ports is not alone in facing this problem. Consortia are not likely to opt for just one manufacturer, and they know they will need a supply base and fabrication facilities. However, as Barker points out – what will happen when several developers approach the relatively small supply chain all at once? It has become a chicken and the egg situation – the supply chain will not ramp up until there are orders, but the orders may slip away if they do not ramp up in advance. “We've had lots of people around who have said: ‘Yes, we would love to do this, would love to do that,’ and we say: ‘When do you want to do it?’ And they say: ‘When we have an order’,” Barker says. When it comes to Forewind, PD Ports are positive towards the idea of collaboration, but say they will need to know one way or another soon. PD Ports has other potential clients and sectors they could develop, he warns. Barker goes on to criticise developers for appearing to think the supply will be ready and waiting when they require the wind turbines, foundations and infrastructure. “I think the frustration for everyone is that somebody has got to make a decision. They are already talking about going past the 2020 time frame,” he says. He is also incredulous that Round 3 has been announced long before Round 1 and 2 have been completed, and Round 4 is expected to be announced around 2014. 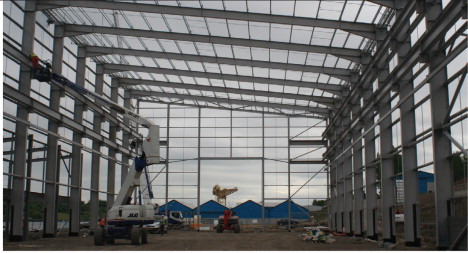 Construction firm Heerema's facility in Hartlepool (North East England) is reportedly the largest indoor fabrication hall in the UK. It built the transformer platform for Greater Gabbard, and is now working on two 1000 tonnes transformer platforms for the Sheringham Shoal offshore wind farm. To design and build one platform takes about 18 months. The Greater Gabbard platform took about 17 months from contract being awarded, “but it was quite a challenge,” Moran says. However “as the industry develops, the rules will become clearer.” The Round 3 substations are probably going to be larger – more on size with medium to large oil and gas platforms – perhaps 3500-4000 tonnes. Heerema is already speaking to landlord PD Ports about expanding its buildings to include subsea structure facilities. “Say we are talking 5000 subsea structures by 2020 – the most we could ever build, if you take all the land and build five new sheds pretty much twice the size of what we've got now – the most we could ever build is 100 a year. “The Round 3 licences have been issued now and we're trying to engage in conversations with the developers to see whether there is any interest in some kind of partnership to develop fabrication facilities. Clearly a company like ourselves can only guess at the capital cost of something like that, but it's probably a couple of hundred million pounds. We don't have that kind of money and we can't afford to build a facility where we have no work guaranteed. Jackson says Heerema is willing to expand, “but for us to say: right, we're going to build it, we need someone in the background saying: yes, we will come and help you and give you an order for x amount - or else we're not going to build a facility that sits there ready.” And to build a new facility could take 18 months to two years, Moran adds. A 15 MW offshore wind test stand (Fujin). 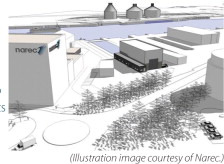 By 2012, Narec also plans to have its 100 MW offshore wind R&D site in operation. The site will have water depths of 30-60 m with room for 20 wind turbines in the 5-10 MW class. The infrastructure cost of the project is estimated at £18.5 million. Alan Lowdon, Director of Technology & Innovation, says Narec is already attracting overseas clients and that the centre is an attractive one to replicate. The centre has already been asked for advice in the design of similar centres outside the UK. However, this does not seem to have dawned on many developers and those higher up the food chain in the offshore wind industry. When Heerema hears the offshore wind industry talk about shortage of bearings, or a shortage of blade manufacturers, it raises the question about the shortage in fabrication facilities and materials such as steel. But: “They just look at us as if we're stupid. They haven't even looked at that side of it. They have just shut major steel works 20 miles from here – and in three or four years' time, there's going to be a shortage of steel to build everything we need. JDR Cable Sytems is so far the only cable manufacturer in the UK involved in offshore wind. Steve Parfitt, General Manager at JDR Hartlepool, says the company has just finished the 200 km of array cables for Greater Gabbard wind farm, and this summer JDR Cables started work on the array cables for the London Array, which will total about 230 km. Parfitt expects it will take about a year to get the cables ready. Unlike many parts of the supply chain, Parfitt says they have not had problems finding skilled people as there have been cuts in jobs in similar industries. At the moment, JDR Cables only has the capacity to produce array cables, but it is in the process of investing in a vertical lay-up machine which will increase output significantly as longer pieces of cable could be manufactured in one go. Parfitt expects to commission the new machine at the beginning of 2011. This means that JDR Cables will be able to produce export cables, which could expand its business opportunities further. The company has also just been granted permission to more than double its 100,000 ft2 facilities by adding 116,000 ft2. JDR Cable has also worked on the Wave Hub project, which is now installed off the coast of Cornwall in the UK. The subsea power cable is 25 km long. In addition to producing array cables, the company also service and repair cables once installed. Parfitt does not believe that the UK supply chain can, at the moment, meet the needs for Round 3. However, JDR Cable has, like Shepherd, had the confidence to invest now for what is likely to come. “We are nearly two-three years ahead of the big impact. Round 1 was really to test, to see what people could do – if we could put these things offshore without them falling over. Round 2 is a bit more serious in terms of volume. Round 3 is going to be the big push. TWI, which used to be a welding training centre for offshore oil and gas, is now helping local companies that want to make the transition to offshore wind. The centre demonstrates new technologies and equipment, provides training, consultations, failure investigations, and research into new materials. Although many skills are transferable from oil and gas, offshore wind brings with it unfamiliar materials such as the use of composites, and a much larger manufacturing scale is needed than oil and gas has ever faced. However, as mentioned by PD Ports, there is a chicken and egg situation. “The problem we see in the wind industry in general is that the market has been stifled for years. We've got lots of sites that could have been developed, lots on the planning board, and then companies have gone to the wall because the orders haven't come through. And the orders have flowed in insufficient quantity. – Not enough to make it profitable. We never had a continuity of orders,” he says.